This is the main part of the game. A specific team is recommended for each mission level to efficiently face it's challenges. The game will show you what are recommended hero roles and minimum power to complete each mission. 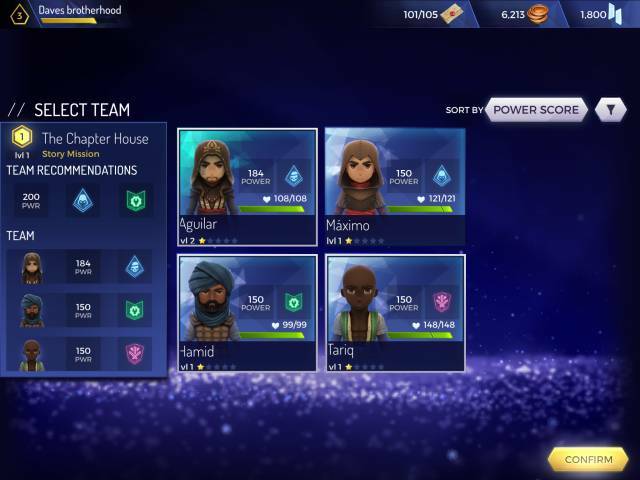 You can edit your team before you start a mission to get the best Heroes to match the roles needed for each mission. Complete missions in story mode to progress your fight against the Templars. Each story mission completed will unlock new missions to play, once you complete all missions in a region, the next region will become unlocked on the map. For this early mission the game recommends at least 200 power in total as well as taking a hero that is good in the stealth role as well as a hero that is good at the disarm role. These offer unique type of rewards. Completing Legacy Missions can yield DNA Fragments for a Hero. You need these fragments in order to unlock more Heroes so these legacy missions are important to complete as well as normal missions. You can also acquire DNA Fragments from the Shops Animus Data Cubes. You can claim a free Animus Cube once every 4 hours. These missions are not available right away, but soon become unlocked when you reach brotherhood level 4 and represent another good way to acquire the items you need to power up your Heroes and develop in the game.